In the restaurant business or take-away business, you can always rely on the valuable exposure you can gain with Napkins with personalised printing as an inventive and stylish way to advertise your Company branding, logo and contact details. Print your own, print on any colour of napkin of your choice, you can leave a batch of these on the dinner, buffet or wedding table - the dining experience would be even better with the extra added panache that these Napkins with personalised printing can offer. Be creative and be custom, these Napkins with personalised printing have a range of colours and personalised printing options that can look simply stunning with the extra touch of your corporate branding. 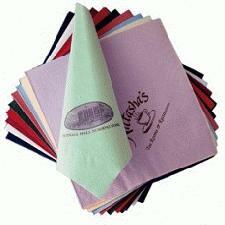 For a FREE QUOTE, please fill in the form regarding our Napkins with personalised printing and we'll be able to help you.